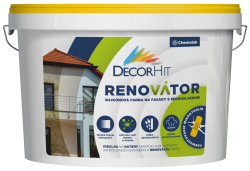 is used for the final surface treatment of plasters, dry masonry, concrete, plasterboard. Paint is ideal for renovation of older insulated facades. The final coating is preventing buildings from weather, abrasion, molds, mushrooms and algae. The color includes special microfiber, which bridges microcracks in damaged plasters.